Our program integrates bodywork with principles and skills from somatic psychology, contemplative practice, and affective neuroscience that can be applied professionally during massage therapy sessions and personally throughout one's life. Accepting applications for Oct 2019. Our Somatic Bodywork program provides professional massage therapy training with an emphasis on embodiment, mindfulness, therapeutic alliance, and the latest neuroscience of pain, stress, and trauma. Our trauma-informed and resiliance-building program provides an effective set of powerful awareness and communication tools from somatic psychology, contemplative practice, and affective neuroscience for both professional and personal applications. Our DOE-licensed, NCBTMB-approved, 800-hour program exceeds the criteria for massage therapy licensing in 48 states, with instruction in massage theory and practice, anatomy & physiology, kinesiology, pathology, ethics, business, and more. Kauai offers an ideal setting for study, personal growth, and outdoor exploration, including lounging on endless beaches, surfing and paddle-boarding in warm water, frolicking in majestic waterfalls, and hiking in epic landscapes such as the Napali Coast. The Professional Trainings are a combination of skill development, knowledge, and presence, with special attention to learning about oneself. We believe that living into greater self-understanding, working through or letting go of what is not essential, or simply being with what is, will support us as we come to know who we are. Therefore all programs are oriented to both personal growth as well as professional development. This approach to living and professional life is expressed in greater well being, happiness, creativity, and better service to all beings. All programs are offered in an atmosphere of support and safety to help facilitate exploration, greater Awareness, and the expansion of the experience of Joy. We believe that all behavior emerges out of positive intention and that the combined power of touch and presence-centered awareness can bring about remarkable healing that leads to greater joy and wellbeing. To educate and promote extraordinary people committed to becoming skillful massage therapists and compassionate human beings by providing a rich curriculum, expert instruction, and a focus on awareness and compassion in a natural, safe, and awe-inspiring environment. We believe that peace begins with ourselves, and we often joke that PCAB is actually a peace organization fronting as a massage school. It’s not a very well kept secret. My experience…has been transformational. 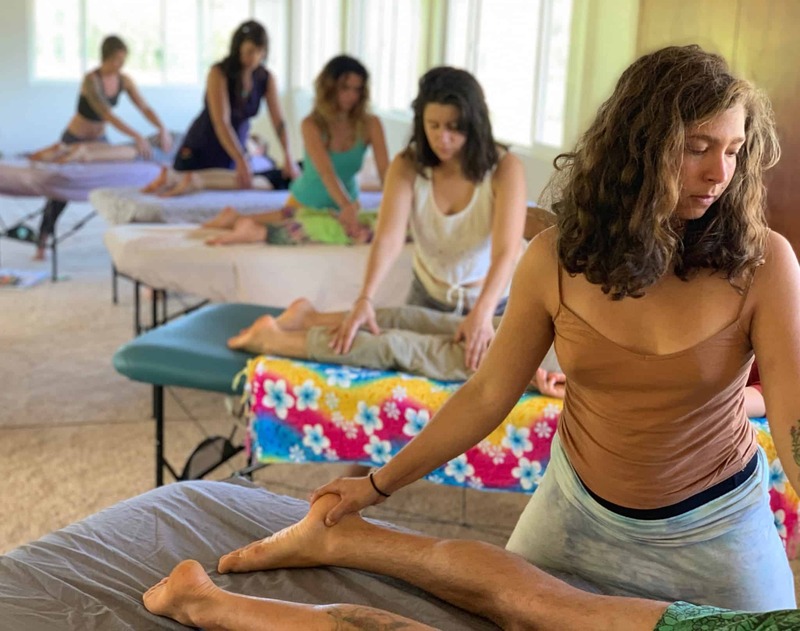 More than any other course I’ve taken, this one has a structure that allows us as students to not only learn advanced bodywork practices, but to also make a deep self inquiry in a safe and nurturing environment. I came out of the program happier and feeling more alive and feeling ready to pursue my professional career in massage. During my study time for half a year, I not only gained new techniques and tools to serve my clients, I also learned how to combine and integrate everything else I studied before in one session with a holistic approach. It was the ultimate experience and place of rebirth for that time. After my first week at this school, I knew this was exactly what I searched for a long time. Many times I was told that I have “unrealistic” visions, therefore to study here was truly a revelation and confirmation that it truly is possible. This six month program exceeded any expectations I had. I can honestly say I am a new person inside and out. More alive and present than ever. Besides the rich learning of bodywork, I have been busted open emotionally, felt shifts in perspective, awareness beyond my ego, and healed some deep issues within my soul. I feel blessed to have followed my heart to the magic of Kauai and this program. Before I decided to go to PCAB, I watched 2 years worth of students and was highly impressed with the transformational changes I saw in them as they went through the program. It seemed like whatever they loved they became better at, be it bodywork, dance, or any other heart calling. Clearly, something was going right in there, so I decided to go too. Now I am a professional massage therapist as well as a happier, healthier human being. In addition to working at a spa, where my client feedback is outstanding, I also own a massage therapy business that sends work to some of the best therapists on the island, many of whom (I can’t help but notice) are also graduates of the PCAB program. My education at PCAB prepared me to step into a role I’ve long been moving towards. It helped shape my own healing process, simply by bringing the energy of truth, awareness, and love into my heart. The transformations that have come from that simple medicine are monumental. For anyone who has searched for a curriculum that explores the realm of combining bodywork with a larger process of healing and freedom- look no further. 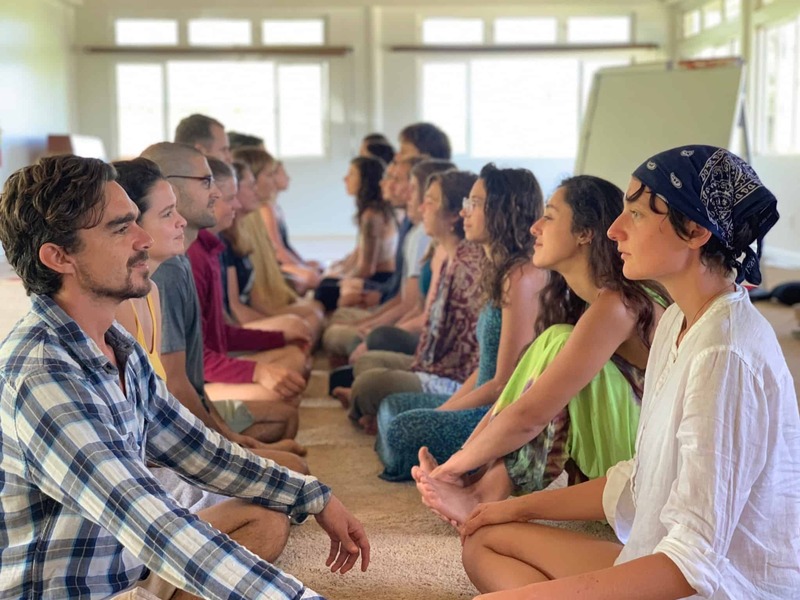 You will find yourself at home on the beautiful and nourishing island of Kauai, and you will find yourself learning what you’ve always wanted to learn at the Pacific Center for Awareness and Bodywork. Awareness practices are the gift of my education here. These tools cracked my “reality” open just enough for me to be un-blinded. I walk away with massage skills beyond what I knew were possible and a taste of infinite possibilities. Everything I should have learned in grade school about how to live in the world, plus high-level bodywork training. I would recommend this experience to anyone. In fact, I would love to have the opportunity to experience this magic time again. Thanks so much [to] all who contributed. An incredible journey It’s been. Fully transformational and healing. I felt really balanced and clear during this training. I opened up more than I had expected and learned incredibly valuable skills and tools for succeeding in this life. Changes I’ve noticed? Tons! Emotional, physical, psychological, and most of all spiritual. More freedom. More self-confidence. More comfort -ability to look people in the eyes. A new sense of identity! A feeling of having strengthened myself and my awareness so much that it doesn’t matter if I ever even gave another massage. I loved this course, much more than a course, more like a passage or a rite towards inner peace and personal freedom in this life. I’ve experienced in my body changes that I wanted to have inside. I just feel more clear about the connections between body and mind. So much more than a course in bodywork. A great opportunity to heal yourself as well as others in your life. Phenomenally powerful tools aid in the healing of our world. After studying and practicing massage for 8 years, and then taking [this] class, I am blown away! This class is everything that I have always wanted to learn, wrapped up into one spectacular, incredibly informative class. The Bodywork… is the most effective that I have ever experienced. I am watching my classmates and myself transform before my eyes, and not just physically. We are all becoming more of ourselves. Plain and simple, I have uncovered layers of my being, emotionally, mentally and physically and also have a thorough understanding of what I believe to be the best Bodywork available. [The staff] are amazing – extremely present and very aware. I feel honored to have been able to spend such quality time in their presence. Physically, I feel more structurally aligned with gravity. I am using less effort to do everything, therefore having a more efficient approach to movement and being. Consciously, I am aware of my thoughts. I’m not perfect, but the awareness is there and is growing stronger day by day. The self is amazing. Emotionally, I am more at peace in feeling my emotions without shutting them down. It is a beautiful experience day to day in the newfound realm of emotions. Professionally, this Bodywork is amazing! It has the potential to take anyone anywhere. It’s up to the student/client! This is not just the best massage school, it is life training. This school has had an enormous impact on me. So much more than just a massage school. It is truly a center for awareness. I have experienced a very accelerated growth process. So here, I begin the awakening. It is like I am being given the tools to really find what’s inside….helping us all to heal ourselves so that we can really help to heal others. All I can say is, THIS IS IT! Now my bodywork comes more from a place of presence and focused intention, that center of the self. I now can connect deeply and easily into that place, the place of unity. I feel I learned something about how we choose our experience and how to choose joy and happiness as a means to appreciate my life. This stuff really helps. It works, and is worthy of my full attention. I am very impressed with the work, physically and emotionally. This deep tissue work not only helps realign the structure of the body, it also reaches into the soul and brings up issues that also need healing on that level. I have found within myself a place of peace and loving acceptance from where healing can begin. For if a client is to receive that into their heart and being, it has to be present in the therapist. [This] work…encouraged in me, the self trust and strength to be fully present and heartful in my work. It brought awareness, openness, and understanding to begin the healing process in my mind and body. I am very pleased with the process, which changed my posture. I am more aware, less selfish, more loving and have a greater understanding and love for myself and body. This has been a profound and awakening time. I feel renewed and reborn. Best points: Deep awareness of instructors & their willingness to pass that self & other awareness on. Taking time to experience presence. Humor. Knowledge. I had heard (from others) that I would go to another level of understanding—yet I never realized how many tools I’d be given, how beautiful the experience, nor how free to be present with self & others I would be. NEVER will I forget the insight & unconditional love. Receiving the sessions increased my personal body awareness by a thousand fold. It gave me a concrete base to work from. It gave me an amazing appreciation for my own body and all those around me. I believe wholeheartedly that this is one of the greatest experiences of my entire life. This is something that I am not afraid to mention to anyone who cares to ask. It was a turning point in my life. Within this amazingly nurturing group, I had my first truly enlightening experience – over and over!! There were days I didn’t think I could possibly learn more, but I did. My own internal growth occurred at such a rapid pace that I had to surrender to the divine and simply hang on. I can never begin to thank you enough for things that are not even explainable.